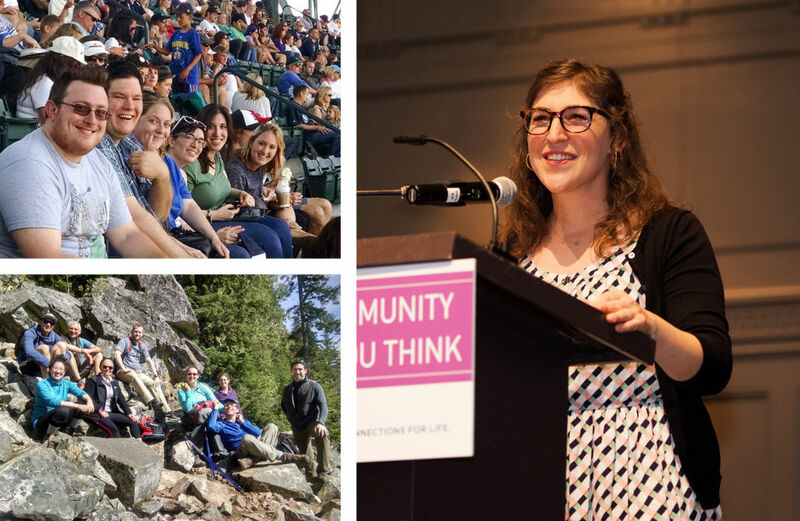 Right: Mayim Bialik presents at Neighborhood Connections May 19. Left: Mountain hikes and Mariners games are just some of the events PAVE Seattle offers to help Jews in their 30s and 40s find connections to Jewish life. The 2014 Greater Seattle Jewish Community Study highlighted that nearly all Jews in the Puget Sound region feel that being Jewish and doing Jewish things are important to their lives. Barriers like traffic, accessibility, and not feeling welcome, however, decrease participation. The Jewish Federation of Greater Seattle created Neighborhood Connections to tear down those barriers and create new opportunities to easily take part in Jewish life, as part of its long-term goal of serving the community’s needs. Neighborhood Connections brings Jewish life closer to home and closer to people’s interests, giving them easy access to Jewish activities that call to their values and align with their interests in welcoming ways. Jewish life becomes much more engaging and dynamic as a result, says Keith Dvorchik, the Federation’s president and CEO. It will take a long-term, community-wide effort to connect more people to Jewish life in ways that meet them where they are. We’re all in this together. To find out more about creating Neighborhood Connections that will entice more people to Jewish life, in March 2016 the Federation contracted with Seattle-based EMC Research to survey the community. The new research builds on the 2014 Greater Seattle Jewish Community Study, by digging more deeply into people’s preferences for living a vibrant Jewish life. EMC sent the survey to 25,000 email addresses in the Puget Sound Jewish community. Results were striking: 92 percent enjoy participating in Jewish traditions or holidays, 88 percent prefer events that are culturally Jewish but not religious, and 81 percent are interested in attending small, intimate Jewish events. At the same time, people face significant barriers to plugging into Jewish life. Over half the survey respondents said they aren’t interested in existing programs. Over half also said they don’t want to fight traffic getting to programs. More than one-third said they don’t feel welcome at Jewish events. This is where Neighborhood Connections comes in. Neighborhood Connections builds on the progress the Federation has already made to bring Jewish life closer to people in underserved neighborhoods and to offer opportunities to be a part of small, intimate Jewish events that people want and where they can feel welcome among new and old friends. 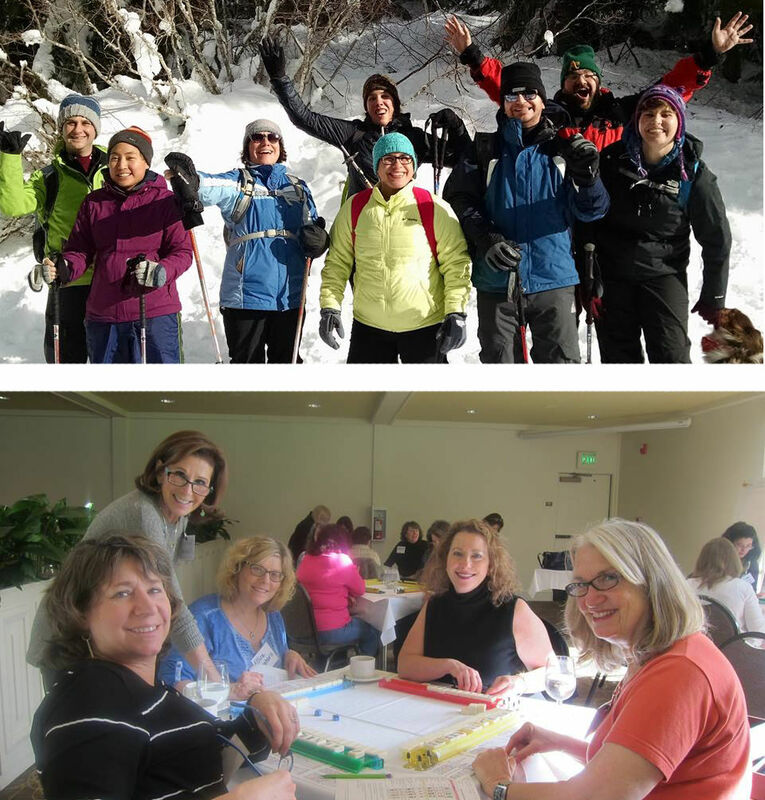 Snowshoeing trips and game nights bring the Jewish community together. The Federation expanded the PJ Library Neighborhood Song & Story times from seven weekly events to 12 weekly events throughout the region, increasing its investment in the program by over 70 percent. New expansion of the free events where families can get together at no charge for storytelling, singing, and a chance to meet new friends has made connections more accessible in areas such as Green Lake, Greenwood, Ballard, West Seattle, and Factoria. “We want to offer long-term sustainable programs, with regularity, that people can count on,” Dvorchik says. This spring, the Federation went further in creating close-in, informal Jewish connection opportunities with a Pop-Up Shabbat celebration in Issaquah in partnership with Temple B’nai Torah as well as Pop-Up Passover Seders in Ballard, Issaquah, and West Seattle. The Pop-Up Shabbat and Passover Seders fit the bill for what many people are looking for — simple, accessible events where people of all ages gather to live Jewishly together, on their terms, and planting seeds of community that will enrich Jewish life.